Author: Mercier, Pascal Set In . . . Description: The bestselling novel of love and sacrifice under fascist rule, and “a treat for the mind. One of the best books I have read in a long time” (Isabel Allende). Raimund Gregorius, a professor of dead languages at a Swiss secondary school, lives a life governed by routine. Then, an enigmatic Portuguese woman stirs his interest in an obscure, and mind-expanding book of philosophy that opens the possibility of changing Raimund’s existence. 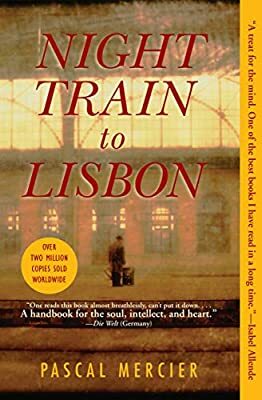 That same night, he takes the train to Lisbon to research the book’s phantom author, Amadeu de Prado, a renowned physician whose principles led him to confront Salazar’s dictatorship. Raimund, now obsessed with unlocking the mystery behind the man, is determined to meet all those on whom Prado left an indelible mark. Among them: his eighty-year-old sister, who maintains her brother’s house as if it were a museum; an elderly cleric and torture survivor confined to a nursing home; and Prado’s childhood friend and eventual partner in the Resistance. The closer Raimund comes to the truth of Prado’s life, and eventual fate, an extraordinary tale takes shape amid the labyrinthine memories of Prado’s intimate circle of family and friends, working in utmost secrecy to fight dictatorship, and the betrayals that threaten to expose them. “A meditative, deliberate exploration of loneliness, language and the human condition” (The San Diego Union-Tribune), Night Train to Lisbon “call[s] to mind the magical realism of Jorge Amado or Gabriel Garcia Marquez . . . allusive and thought-provoking, intellectually curious and yet heartbreakingly jaded,” and inexorably propelled by the haunting mystery at its heart (The Providence Journal). Night Train to Lisbon was adapted into Bille August’s award-winning 2013 film starring Jeremy Irons, Lena Olin, Christopher Lee, and Charlotte Rampling.